FRISCO — If Texas coach Tom Herman is bothered by his team being picked to finish fourth in the Big 12 this preseason, it doesn’t show. “They’re assuming you stay healthy. They’re assuming there’s no off-the-field issues. It’s assuming a lot,” Herman said Tuesday at Big 12 media day. 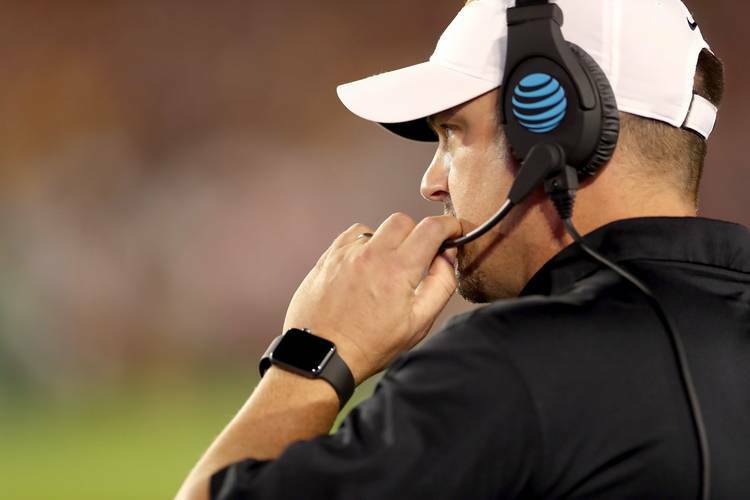 “To say this has that kind of potential or that, we feel like we want to be in contention, in the conversation for the Big 12 championship in the months of November and December. Herman opened his 20-minute session at The Star by praising UT President Gregory L. Fenves and Athletic Director Chris Del Conte. “We do have a championship administration,” he said. Then, the UT coach detailed all of the impressive offseason numbers that were accumulated in the weight room. Herman said 60 Longhorns can vertical jump at least 30 inches, and 42 players can power-clean at least 300 pounds. Texas was 7-6 in Herman’s first season. Perhaps more important, it snapped a three-year losing streak. The Longhorns are four games under .500 over the last four years. “Last year we had a lot of compliant guys,” Herman said. “Yes, sir. They nodded their head and do what they were asked to do, but I don’t know deep down if they believe in their core the way we’re doing things is the only way you can win a championship. Sam Ehlinger and Shane Buechele are the team’s two veterans while freshmen Cameron Rising and Casey Thompson will battle for playing time, too. “I’m telling you, those two young quarterbacks, those two freshmen are going to give those two older guys a run for their money as well,” Herman said.